From the romance adventure game which has now even made its way onto the PSP, “D.C. ~Da.Capo~” comes a Nendoroid of one of the main heroines, Nemu Asakura! Everything from her trademark ribbons and school uniform down to the finest details on her school bag have all been recreated in adorable Nendoroid form! Nemu comes with three expressions for you to enjoy: A cheerful smile, an embarrassed face and an expression that is based off the mini-game called “AFTERBANANA”, which has her looking rather angry! Utamaru, the mysterious cat and Da Capo mascot is also included with Nemu, for even more fun! Yamato USA is pleased to announce the next installation in its Fantasy Figure Gallery: Discovery by Boris Vallejo as interpreted by sculptor Erick Sosa. Journey to distant lands in search of a hidden kingdom with Uleena and her companions here in this magnificent resin statue. Standing approximately 11.00” with themed display base, this dioramic resin includes both female and monster figures. A discovery in its own right, Yamato USA’s Fantasy Figure Gallery: Discovery (Boris Vallejo) can be found spring 2011. Includes art card and certificate of authenticity. 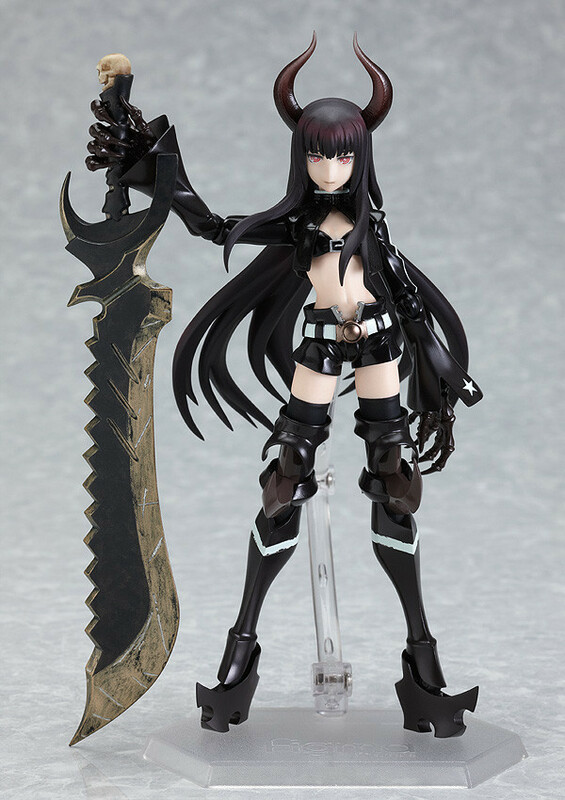 From the anime “Black Rock Shooter” comes a figma of the mysterious ”Black Gold Saw’, who was seen fighting with Black Rock Shooter at the very beginning of the movie. Here’s the latest batch of figures in the Classics Collection. Remember stock is very limited! The 100th Revoltech Yamaguchi was unveiled earlier today. There had been plenty of speculation of what the 100th release would be. In the end it was a new EVA-01. Some of the new features include a glowing color scheme, improved articulation, new accessories and a LED angel themed base. Pre-orders will be opening mid November and will be released in January 2011. From the freely distributed anime “Black Rock Shooter” comes a 1/8th scale PVC figure of Black Rock Shooter’s rival, Dead Master. Her pose has her jumping through the air effortlessly, even while wielding her huge scythe, “Dead Scythe”. The stand she also includes the two skulls she controls in the anime, which really brings the figure together and pulls out Dead Master’s dark charm. From “Hayate the Combat Butler”, the comedy series filled with love and war(?) comes a Nendoroid of the main heroine and the daughter of the Sanzenin household, Nagi Sanzenin! She comes with three expressions, including a smiling face, an embarrassed face and a pompous face perfect for Nagi. She also comes with various extras such as a gaming console to let her play her favorite games, as well as the important hat that was blown off head in the series. Her loving pet Tama is also included for even more fun! You can display her however you see fit – from an energetic and happy Nagi down to an embarrassed and blushing Nagi… the possibilities are endless!